So, tabbouleh used to be one of my favorite dishes in the whole wide world, until I discovered that I have a gluten intolerance, that is. Result, I have not been able to enjoy this dish for some time now. It's a real bummer when you can't enjoy your favorite things anymore because of some allergy or other. 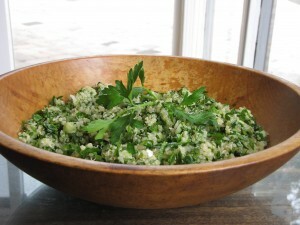 Well, so much the better in this case, this is a bomb quinoa tabbouleh recipe I stumbled on. Using quinoa makes it far more nutritious and it is still an amazingly delicious dish. Looks like things sometimes just work out for the better, enjoy! 1/4 Cup Extra Virgin Olive Oil Yes, Extra Virgin matters! 1/2 Cup Lemon juice Fresh press that lemon, OR ELSE! Bring 2 cups of water to a boil, add in the quinoa and bring back to a boil. Reduce to a medium heat, cover, and cook until all of the water has been absorbed, about 12 minutes. Remove from heat, fluff, and pop it in the fridge to chill. This should yield about 4 cups. While the quinoa chills for about 10 minutes it is a good opportunity to prep the rest of the ingredients if you haven't already. After the quinoa is chilled just mix all ingredients together in a mixing bowl, toss it well, and let it chill for a good hour to allow the flavors to blend. This dish serves well with a baked sweet potato, give it a try!